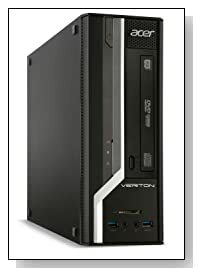 Black Acer Veriton 2 Series VX2631-UR10 is a low-cost desktop with a small and lightweight size at just 30% the size of a regular desktop tower. It not only saves on space but also is easy to set-up, comes with decent technical specs and connectivity ports, is designed to be functional and versatile for either school or home entertainment use with a modern design and offered at an affordable price below $400. Acer VX2631-UR10 has an Intel Pentium dual-core processor G3220 (3MB Cache) at 3.0 GHz speed, 4 GB DDR3 RAM memory that can be upgraded to a maximum of 16 GB, 500 GB Serial ATA hard drive at 7200 rpm rotating speed and 64-bit Windows 7 Home Premium so overall it delivers good performance for usual daily tasks such as web browsing, preparing school assignments, watching movies and playing light to medium level games. 4GB memory allows for very smooth multitasking in daily use and 500GB is good amount of storage space that should be enough for most customers. Black modern Acer has a soft front surface with metallic finish. It weighs 13.7 pounds with dimensions of 14.49 x 4.02 x 10.51 inches, so it is fairly lightweight, compact and portable for a desktop, doesn't take up much space on your desk and you may use it horizontally or vertically. It works quietly and manages to stay cool even after hours of running. The top cover can be removed easily, all you do is unscrew two screws at the back panel. When you open it up and have a look, you'll realize that the quality of components and build of this Acer desktop is great for such a budget machine. It comes with two memory slots: One of them has the 4GB RAM and the other is left empty if you wish to add another one and it supports up to 16GB of memory. Intel HD Graphics 4000 offers decent image quality and good gaming performance but not suitable for the most advanced games. High-Definition Audio with 5.1-Channel Surround Sound offers clear and loud sound that gives you almost a feeling of a home theater experience. Connectivity options include 4 x USB 2.0 Ports, 2 x USB 3.0 Ports for much quicker transfer of data, 16X DVD±R/RW SuperMulti Drive, Digital Media Card Reader that supports Secure Digital Format, HDMI port, VGA and DVI ports, 802.11 a/b/g/n wireless, 10/100/1000 Gigabit Ethernet LAN, Audio Line In and out jacks, 2 Expansion Slots- 1 x PCI Express x1 Slot- 1 x PCI Express x16 Slot, Keyboard and Optical Mouse. Conclusion: Black and silver Acer VX2631-UR10 provides great value for dollar, considering its performance, build quality, design, multitasking ability, sufficient storage, HD quality audio, great range of connectivity options and more importantly Windows 7 that it comes pre-installed with rather than Windows 8- there aren't many of Win 7 OS computers in the market these days. It is more for the budget conscious computer customers with its lower price. If you're looking for a more powerful desktop with bigger processor and larger RAM and storage for more advanced stuff like multimedia editing and gaming, you need to spend a bit more. This one will do the job for day-to-day computing smoothly and efficiently.